I can’t believe I never posted this recipe! 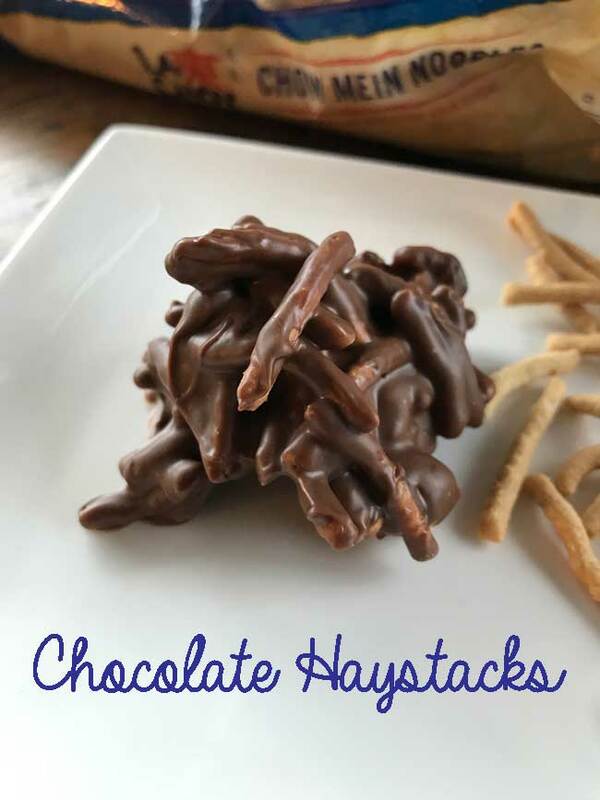 It’s an old one and you may know it, but how often do you remember to make Chocolate Haystacks? These are real crowd pleasers, and they are so easy. Made by combining chow mein noodles with a mixture of melted chocolate and nuts, there are a more than a few variations on Chocolate Haystacks. My favorite is this one, which calls for a mixture of melted chocolate and butterscotch morsels. The recipe will give you about 36, but if you just want to make a small batch for the family, it’s easy to halve or even quarter. An old favorite for sure, Chocolate Haystacks are an interesting combination of chow mein noodles, butterscotch and chocolate chips. Combine the chocolate chips and butterscotch chips in the top of a double boiler. If you don’t have a double boiler, you can do it directly over low heat in a large saucepan. Remove melted chocolate mixture from heat, then stir in noodles and peanuts. I recommend stirring in 3 cups of noodles first, then adding more as needed. Fewer noodles means more chocolate. Drop by spoonfuls onto a plate lined with wax paper or parchment paper. Put in the refrigerator and chill until firm. That is so kind of you to say, and you may never know how much it means to me (especially these days). I’ve been reading your blog for years, YEARS! !…but I’ve never commented. I just wanted to say thanks for all the wonderful recipes, and for having a blog that feels as welcoming as home. The world is wide and wearying enough as it is but I really do enjoy spending a few calm minutes reading about what you’ve been up to in the kitchen. I work far from home and it’s lovely to have a familiar place to read about your baking adventures! Somebody made these at a food blogger cookie exchange years ago and they were my favorite thing from the whole exchange. So yes — not sure why we always forget about them. I should make these sometime. I’ve had them but not made them myself. There are so many times they could be just the right thing. I had a friend who made these for Christmas. The one I loved best. I rarely make them myself but they are always a success. Thanks!